Mika Zibanejad had a goal and an assist and Alexander Georgiev earned his first NHL victory as the New York Rangers came away with a 3-2 victory over the Edmonton Oilers on Saturday. Alexander Georgiev has his first NHL win under his belt. The 22-year-old backup goalie made 35 saves and forward Mika Zibanejad had a goal and an assist as the New York Rangers came away with a 3-2 win over the Edmonton Oilers on Saturday. Georgiev, who started the season in the AHL after playing last season in Finland, came into the game with an 0-2-0 record, a 3.05 goals-against average and a .922 save percentage in his brief NHL career. "It feels unreal, something like a dream. It is an amazing feeling and one I will remember for my whole life," said Georgiev, the first Bulgarian-born player in the NHL. "The guys came out and wanted to win really bad. We had confidence from the last couple of games and brought it into this game." Chris Kreider and Paul Carey also scored for the Rangers (30-30-6), who have won three straight games. 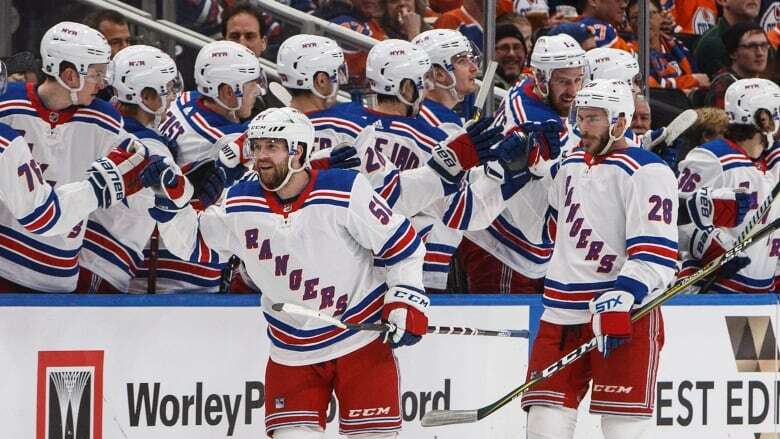 "We hung on there a little bit, but I really liked the way we played, we had good energy that first goal gave us even more energy," said Rangers head coach Alain Vigneault. "We played a strong first, we had some real good looks in the second. Obviously their top players are top-end players and they're going to get some looks and we hung on there and our goalie made a couple of big saves." Connor McDavid and Ryan Nugent-Hopkins responded for the Oilers (27-34-4), who have lost three in a row. The Rangers started the scoring just 54 seconds into the game on their first shot when Zibanejad fed it across to Kreider, who sent the puck into the net before Oilers goalie Cam Talbot could get across. It was the 13th time this season the Oilers have allowed a goal on their opponent's first shot of the game. "Unfortunately that wasn't the start we wanted," Nugent-Hopkins said. "The second half of the game, we played a lot better. I think we kept things simple for the second half of the game and it started to work out for us. "I think we're just over complicating it a little bit." Edmonton tied the game six minutes into the second period when an innocent-looking McDavid shot snuck in past Georgiev for his 30th goal of the season. The Rangers regained the lead on the power play a couple of minutes later as Zibanejad batted in a rebound on a scramble in front of the net. New York got another one shortly afterwards before the midmark of the second as Talbot got a piece of a Carey shot before it trickled in behind him. The Oilers made it a 3-2 game with three minutes to play in the middle frame as McDavid turned on the jets before sending a backhand pass to Nugent-Hopkins for his 17th. The Oilers continue a five-game homestand on Monday against the Arizona Coyotes. The Rangers return home to face the Winnipeg Jets on Tuesday.